. : Optics & Photonics Focus :: Fighting the Noise in Your Communication :. How noise enters our communication. 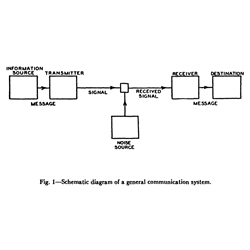 Claude Shannon’s communication model places the noise source exclusively on the channel . In an oral presentation, however, much worse is the noise that comes from the transmitter (the speaker). Ever since the publication in 1948 of Claude Shannon's landmark paper A Mathematical Theory of Communication , anyone working in telecommunication, be it with electrical or optical signals, is familiar with the concept of noise, or perturbation of the signal. While the crackling sound of a radio receiver tuned to a weak signal prompted the term, noise is not limited to acoustic manifestations: video transmissions can suffer from it, too. So can, in a broader sense, measurements that exhibit variability around a mean. Noise has become a common concept, one that any student in a scientific or technical field will have heard of, one that many scientists and engineers have learned to filter or to compensate for. 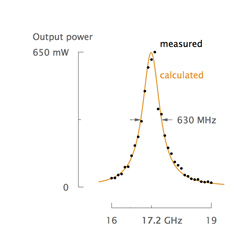 One area where most scientists and engineers must still learn to recognize and fight noise, however, is in their own communication: in the documents they write and format, in the presentations they design and deliver, in the graphs they create. Effective communication can be seen broadly as getting the message across, that is, getting our audience to pay attention to it, understand it, and do something with it. Anything that distracts our audience away from our intended message (the signal) is therefore noise. In communication, nothing is neutral: the audience sees everything and hears everything. Whatever does not help hurts. A noisy graph. The graph has very little of its ink actually showing the data (the thin line and crosses). Much of the remaining ink can be removed. When prompted to come up with examples of noise affecting oral presentations, the participants of my training programs are quick to blame three main sources: other audience members (cell phones going off, attendees talking to each other, people walking in late, etc. ); the room (a microphone picking up feedback, a projector rendering colors poorly, an uncomfortable temperature, etc. ); and the universe beyond the room (road works nearby, people walking past the windows, sunlight in their eyes, etc.). In a sense, they are applying Shannon's model literally, thus placing the noise source on the channel, somewhere between the transmitter and the receiver. So doing, they are letting the speakers off the hook a little too easily. Noise coming from the speakers themselves is typically more damaging to the communication than external noise on the channel. A speaker with a strong verbal tic — for example, one saying “you know” every other sentence — can irritate the audience to the point of making listening nearly impossible. Students all over the world readily admit that they end up counting such filler words from their professors; in other words, they are not awaiting the next message: they are on the lookout for the next “you know” or equivalent. There is thus a total mismatch between their attention span as an audience and the useful content of the professor's lecture — an issue much worse than the occasional cell phone going off. And visual tics are of course no better; any repetitive, meaningless gesture will result in similar “quantum noise locking” (so to speak), just like the periodic drip of a faucet in a nearby bathroom can obsess us to the point of preventing us from falling asleep at night. A more effective graph. This redrawn version of the graph in the previous figure shows a much higher signal-to-noise ratio: every drop of ink is now data-related. Besides the speakers themselves, a major source of noise in oral presentations is the accompanying slides: PowerPoint can easily turn into a noise factory if used carelessly. An equation that appears on the slide a little later than the rest can help keep the audience synchronized with the discourse. However, when this equation bounces around the slide (with sound effect and all) before taking its place, the effect is most distracting. Why would speakers use such special effects? To get the attention of the audience, they will tell you. And do they get the attention of the audience? Of course they do — but on the wrong thing. Audience members are not wondering how the speaker derived this equation; more likely, they are wondering how he or she made it bounce around like that. Similarly, unnecessary backgrounds, colors, or clip art are sure to distract the audience to varying degrees. Noise is of course not limited to oral presentations. In written documents, perhaps the worst source of noise is spelling mistakes and assimilated errors. With more than, say, one or two errors per page, readers who are sensitive to a correct use of the language will likely go into spell-check mode: they are on the lookout for the next mistake, just like students were on the lookout for the next “you know” in a lecture. Beyond such mechanical errors, however, anything that makes readers stop processing the science behind the text and start processing the text itself (consciously, that is) is noise: a paragraph with no clear structure (“Where is this leading to?”), a sentence with nested subordinate clauses (“What is the subject of this last verb?”), an inaccurate passive voice such as is believed (“Who believes this? The authors? The scientific community?”). In graphs, the signal can be seen as the fraction of the ink that represents data; everything else (unnecessary grid lines, tick marks, symbols, colors, 3D effects, etc.) is noise. A weak slide. The slide conveys information but no message: its title says what the data are, not what the speaker is trying to tell the audience with them. So then, what do we do about noise in an effort to improve our communication? Easy — we filter it out as much as possible, and we compensate for residual noise, if any, by increasing the signal. 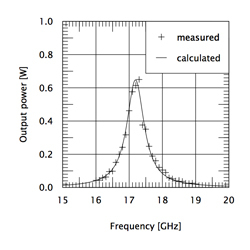 In other words, we maximize the signal-to-noise ratio. In presentation slides, let's start by removing the fancy background, footer, and needless text colors that come with most templates; let's remove the logo(s) on all but the first slide and perhaps the last one; let's question absolutely everything we plan to include: are we sure we need all those bullet points, equations, tables, etc.? 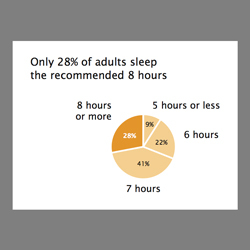 Let's increase the font size, particularly in graphs and diagrams; let's focus on the message. In our delivery, let's eradicate filler words and nervous mannerism; let's make large, deliberate, meaningful gestures and no noise between gestures; let's project confidence by being tall, straight, and stable; let's ensure presence by looking at the audience straight in the eyes. In our written texts, let's run the spell-checker systematically — even on e-mail, even on a first draft on which we seek advice from our supervisors (if they go into spell-check mode, do not expect any feedback on content or structure). Let's work on structure at all levels, from the whole document down to a single sentence. Let's answer the questions of the readers (if we believe they want to know who, let's tell them who). In our graphs, let's reveal the data above all else; let's remove the decoration; let's increase the line thickness. In the end, the only thing that the audience can pay attention to in what we give them is the intended message and supporting evidence; everything else is gone. The easiest way to filter out the noise is not to introduce any in the first place. Having to cut at review time a visual element we created or a sentence we wrote can seem as painful as severing one of our own fingers. To those who need an incentive, I recommend my “M&M'S® method”: as you prepare to review your slides, place a bowl of M&M'S candies or equivalent next to you. Every time you can remove an item (a word, a line, a color, a logo, etc.) from a slide without loss of information, reward yourself with one M&M'S candy. This method is sure to contribute to lean slides… and plump presenters. A more effective slide. This revised version of the slide in the previous figure gets the message across on its own. In particular, its title conveys the so what, not merely the what. Even if we manage to remove all noise from our communication, we cannot hope for a lossless environment. 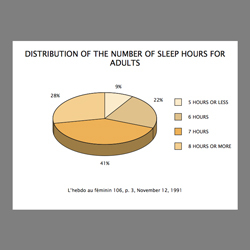 At a scientific conference, for example, audience members are typically exposed to three or four talks an hour, eight hours a day, several days in a row; they are several time zones away from home, likely sleep-deprived, and possibly underfed; and they are often non-native speakers of the language of the talk. Noise or no noise, they can hardly be expected to get every word that every speaker is saying. Beyond maximizing the signal-to-noise ratio, an effective way to deal with such losses is to use some form of redundancy, for example by making sure that our slides in a presentation get the message across on their own — and conversely of course that our spoken discourse gets the message across on its own. Even in less extreme situations, potential readers are likely to flip through our documents and stop at figures. Figures are thus a first and great opportunity to get our messages across. If a figure makes no sense on its own, this opportunity is lost. The combination of a high signal-to-noise ratio and such an “effective redundancy” makes for truly powerful communication, especially for those situations that demand a high density of messages, as when were are trying to summarize many months of research work in a mere 15 minutes of talk or in just a few written pages. Claude Shannon, A Mathematical Theory of Communication, The Bell System Technical Journal 27, 379-423 and 623-656 (1948). 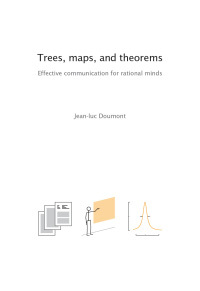 Jean-luc Doumont (Principiae) devotes his time and energy to training engineers, scientists, business people, and other rational minds in effective communication, pedagogy, statistical thinking, and related themes. Articulate, entertaining, and thought-provoking, he successfully reaches a wide range of audiences around the world, in English, French, Dutch, and Spanish—as a trainer or invited speaker at an array of companies, top-ranked universities, research laboratories, and international conferences. He is an engineer from the Louvain School of Engineering and holds a PhD in optics from Stanford University. Based on hundreds of interactive training sessions, Trees, maps, and theorems offers overall guidelines and practical tips toward getting messages across optimally in written documents, oral presentations, and graphical displays. Wide-ranging yet compact, it is true to Dr Doumont’s renowned style, proposing no-nonsense, down-to-earth, readily usable advice underpinned by a simple yet solid conceptual basis and presented in a highly modular visual structure.